Gameinformer joins the industry-wide conversation about casualties of unfortunate production practices. 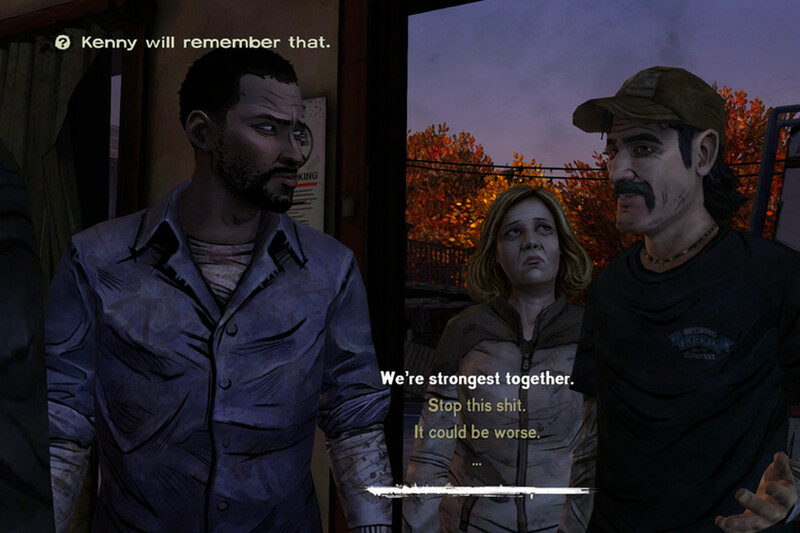 Former employees of Telltale Games spoke to the magazine to relate their heart-breaking story. Telltale signature gameplay has the characters make difficult choices. Each decision leaves a lasting impact. It’s no coincidense that the real people involved with Telltale felt so strongly about this kind of narrative. They, too, had to take many risks along the way. Risks that first put the company on the map and then led to its abrupt demise. By 2004, LucasArts departed from making adventure games. Three employees, Troy Molander, Kevin Bruner, and Dan Connors, felt that the genre was yet to live up to its full potential. So the trio left the company and founded Telltale Games. But following their vision proved a near-gameover experience for the developers as no publishers wanted to distribute their games. The team decided to self-publish and secured several licenses that they distributed digitally in an episodic format. This indie approach kept the company afloat until the next big thing came along. In 2010, two big move licenses came the studio’s way: Jurassic Park and Back to the Future. The studio felt more confident now to fully act on their vision. And in 2012, the whole world fell in love with the deep characters, meaningful story, and the branching player-driven narrative of The Walking Dead: Season One. The mainstream success opened the path to rapid growth, with the size of the studio quadrupling between 2012 and 2018. An indie studio not so long ago, Telltale was now getting big licenses, including the Fables, Game of Thrones, and Guardians of the Galaxy. The studio released Tales from the Borderlands, Batman: The Enemy Within, and The Wolf Among Us to critical acclaim. Minecraft: Story Mode became the bestseller. The experimental nature of the early Telltale Games gave way to replicating the Walking Dead formula in all of their subsequent titles. The strategy, however, proved nonviable. After all, how many games of the year can one make in a row? Moreover, the formula itself turned out to be less universal than expected. In the Batman series, Telltale reinvented the titular character and his foes, but Game of Thrones franchise required a much more conservative approach. Similarly, the darker tone of earlier Telltale titles just wasn’t right for Guardians of the Galaxy. Instead of reconsidering which material to work with in the future, the studio succumbed to the pressure from the license holders. Remember that pesky dialogue timer from any Telltale game? There was never enough time to weigh all your options. Well, the timer was sure on for the real-world people at Telltale. Using the same formula over and over again took a toll on the team’s morale. Short production cycles led to crunches. Frustrated by the results, the executives often demanded significant changes very close to ship dates. Postponing a project to catch a creative breath was never an option as this would have led to backlash from season pass owners. The Telltale Tool engine put a further strain on the limited resources. It nicely supported the story-driven gameplay of the earlier titles. But the lack of an adequate physics system meant that all action scenes had to be done manually. If it were not for the tight release schedule, the studio might have transitioned to the Unreal engine. But the show had to go on no matter what. As the studio execs proved unable or unwilling to take a step back and mitigate the agressive fast-paced production culture, many employees quit. Some joined other companies, others started their own. In any case, this only added to the competition from triple-A juggernauts like God of War, which offered the kind of emotional storytelling that Telltale inspired in the first place. …And then there were no more dialogue options left. With the sales declining, the investors pulled the funding one by one. The company had to make several last choices, which were not choices at all. In 2017, the studio laid off 25% of the staff. And in 2018, it had to let go of 90% of the remaining team. That last massive layoff was particularly shocking as the workers had to leave without severance, without even one day’s notice. In a bitter-sweet ending, Skybound, the original holder of the Walking Dead license, teamed up with a handful of former Telltale employees to finish the work on the final season of the series. Even though the studio is now effectively gone, there is poetic justice to how its DNA is spread across the industry. Former employees now work at other companies, and we, as players, can enjoy games with meaningful storytelling of the Telltale caliber. Did it have to end like this, though? And more importantly, will more companies fall victim to ruthless fiscal objectives? The story of Telltale rhymes with the recent disclosures about BioWare’s production culture that similarly put inadequate amounts of stress on the employees. It seems like the exploitative nature of the industry will eventually leave developers with no other choice than to unionize. Of course, this idea has been around for some time now. In the meanwhile, there are studios like Naughty Dog and CD Projekt Red, which choose to be noncommittal about their much-awaited titles. So, maybe the solution is already there: ship the game when it’s ready. Sure, having to wait for the The Last of Us 2 is frustrating. But isn’t it more frustrating to NOT have to wait for the next The Wolf Among Us game?